Where do I use my TOMS voucher code? Not only do TOMS offer stylish and on-trend footwear and accessories, they also put the power in your hands to make purchases that help the less fortunate. The team at TOMS has always strived to create quality, cool products for men, women and children, with a huge range of accessories that include sunglasses, bags and baby and toddler wear. As well as all this you can also shop from a huge array of shoes including the classic TOMS Alpargatas, boots, slippers, waterproofs, newborn shoes, mini-me shoes, shoes with fun prints and even vegan-friendly shoes. Discover new arrivals every season, shop from the TOMS exclusives section, the best sellers category or the sale. If you’re buying for someone else but aren’t sure what to choose, opt for a TOMS gift card of up to £200 and allow your lucky recipient to invest in a pair of quality shoes, sunglasses or other accessories. As well as all this you can also see how TOMS give with initiatives like their One for One policy, their thoughtful partnerships and goal to improve lives across the globe. The name TOMS comes from the original name of the project that founder Blake Mycoskie wanted to start: 'Shoes for Tomorrow'. He was inspired to start a fashion range similar to the Argentine alpargata shoe but was really passionate about using his creations to give shoes to barefoot kids who couldn’t afford shoes, helping them avoid all kinds of diseases and injuries. Soon after, Blake created the One for One policy, a business model that helps a person in need with every product purchased. This simple idea has since grown into a global movement: TOMS Shoes has provided over 60 million pairs of shoes to children since 2006, TOMS Eyewear has restored sight to over 400,000 since 2011 and TOMS Roasting Company has helped provide over 335,000 weeks of safe water since launching in 2014. In 2015, the TOMS Bag Collection was founded with the mission to help provide training for skilled birth attendants and distribute birth kits containing items that help a woman safely deliver her baby. As of 2016, TOMS has supported safe birth services for over 25,000 mothers. If you’re shopping for stylish footwear and accessories on a budget then check out the TOMS sale section. By shopping for discounted products, you can enjoy low-cost products from a brand you can trust, without compromising on quality. Discover men’s, women’s and kids products in the sale as well as apparel, sunglasses, unisex products and socks for everyone in your family. Remember, as well as the sale section, you can also save money on your order with the free delivery service supplied to you by TOMS, so there’s no need to pay unnecessary charges for delivery straight to your door. When you think of TOMS, their classic alpargatas may come to mind, but this is not the only footwear they sell. TOMS also stock everything from sneakers to slippers and everything in between including slip ons, flats, boots, lace-ups, wedges and baby shoes. Shop by category, size, colour, material and feature to find the perfect shoes for you, with all kinds of options available including suede, patterned, leather, lace, crochet, woven and even vegan shoes. If you’re looking for something truly synonymous with the TOMS brand, shop from the exclusives section, or if you’re after the best of the best check out the best sellers category for popular footwear options that fellow customers have loved. Free shipping is available on all orders. TOMS accept unworn products in their original packaging purchased exclusively from TOMS.co.uk that are received within 30 days from the date of purchase. Use the store locator to find your nearest store and it’s opening times. TOMS is a popular shoe, eyewear and apparel brand that sells a plethora of stylish products both in their stores and online. Shop for shoes, sunglasses and bags, all at affordable prices and enjoy free delivery on your order too. 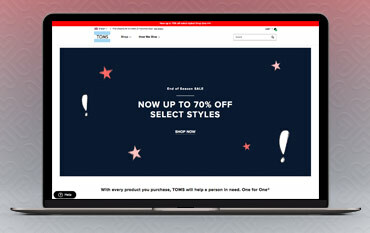 Shop with a TOMS discount or promo code from us and save yourself some money on your purchases, enabling you to kit out your wardrobe with on-trend accessories and footwear for all seasons and occasions. As well as creating cool accessories, TOMS has another purpose too. Whenever you buy a product from them someone in poverty receives something they need too with the TOMS 'one for one' policy, making buying great looking accessories even more satisfying! We are constantly on the hunt for first order Promo Codes for TOMS to help you with your money saving. Our experts check dozens of sites for secret codes including NHS discounts, student sites & social media channels saving you time & money!